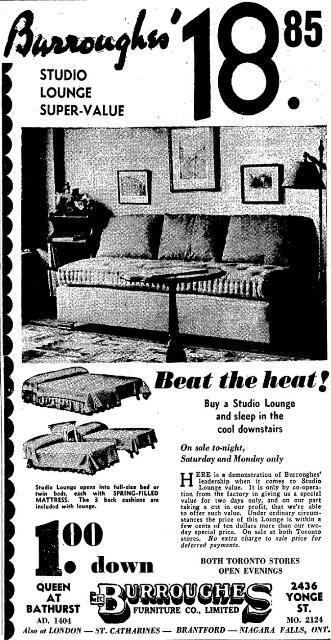 Ad for Burroughes Furniture Co., Ltd., advising you to buy a couch so you can "sleep in the cool downstairs." Toronto Star, July 10, 1936, page 5. If you missed it, I did a series of articles for Heritage Toronto a few weeks ago on a few interconnected subjects relating to Toronto in the summer of 1936. The first looks at Toronto’s experience during the major North American heat wave of that summer. In the early summer, some aspects of city life seem to have shut down while various laws were relaxed; at least 225 people died from the heat. While looking in old newspapers for articles connected to the heat wave, I found several articles concerned with what men were and were not allowed to wear on Toronto beaches, thus spawning an article on the city’s bathing suit regulations. This being 1936, all this transpired during the great depression. My third article looks at some of the unemployment problems in what was then York Township (essentially what later became the City of York in the 1960s and then acquired by Toronto in the 1998 amalgamation). During the height of the heat wave, tensions boiled in Toronto’s suburban regions over how governments should distribute financial relief to the needy. While this article deals with York Township, similar unrest was happening in Etobicoke in 1936, which I wrote about on this very blog. With these protests flaring at the height of the heat wave, it is tempting to think that the excessive temperatures caused frustration to boil over, as it seemingly does in Spike Lee’s Do The Right Thing. 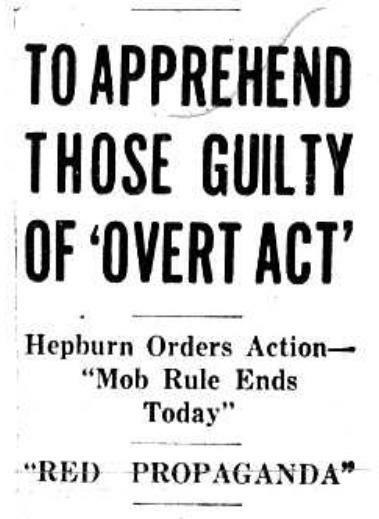 Headline from the Globe, July 10, 1936. While I enjoy researching and writing on a variety of topics, I like doing these clusters of related historical articles. Often, while researching a specific subject, I encounter interesting tangents and side issues which I am tempted to cram into my copy. When I try to share all of these delightful details, my articles grow too long, and I find myself forced to omit some of the bits which I think are the most intriguing. Doing these clusters of articles permits me to provide additional context for the readers, juxtaposing events with parallel issues in Toronto’s history, and providing a more nuanced account of the city’s past. In a previous cycle of articles for Heritage Toronto, I described an incident with a “gypsy” group in North Toronto, both from the perspective of the people in the camp as well as from the perspective of the camp’s bears. In creating these clusters of related articles, my hope is to present Toronto’s complicated history in a spirit similar to that of the classic PBS miniseries Connections, hosted by James Burke. Burke tells the history of science from a strong perspective of inter-connectedness. He generally starts at one specific invention or discovery, and then follows that thread through history, touching on many events, people, and discoveries along the way, all the while reminding viewers this is just one of an infinite number of paths available to explore. Toronto’s history, like all history, is similarly complex. While it is a historian’s duty to provide necessary context, there are many choices that a historian faces as to what to include. By grouping some of these related articles together, I feel I am reminding readers that no person, building, or event is isolated, and that all of Toronto’s history is linked by time, place, people, and/or thematic subject matter. My hope is to work on a few similar clusters in the new year. They tend to involve considerably more research than a “one-off” article, but I feel that the end result is worth it.